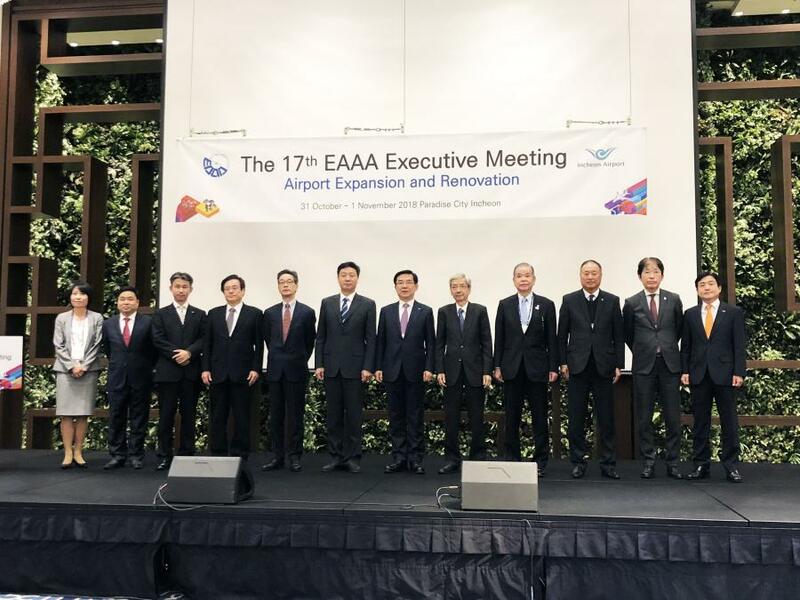 The 17th EAAA Executive Meeting hosted by Incheon International Airport was held from 31st Oct to 1st Nov, 2018 at Paradise City, Incheon, Seoul, executives from 12 EAAA member airports have presented in this occasion. Dr. Deng Jun – Chairman of the Executive Committee of Macau International Airport Company Limited (CAM) led a delegation to attend the meeting. The theme of this year was "Airport Expansion and Renovation”, representatives from each member airports introduced the short and long term development of their respective airports. Sharing how they integrate factors of energy saving, science and technology, humanization, beauty and practicality into the expansion of airport and to design a more sustainable airport construction. As passengers are increasing year by year, traffic in the airports become much heavier than before, some of the airports have reached its capacity and need to further expand and renovate as to create more spaces. Expansion has to consider the rate of increase of the passengers and the limitation of passenger flow. Mr. Sandro Kou – Director of Infrastructure Development Department of CAM stated in his presentation, upon the completion of the north extension project at the 1st quarter of 2018, the terminal building has added up to accommodate 7.8 million passengers as a whole, more local signature dinning and shopping will be introduced to passengers. The south extension of the passenger terminal building has just finished the tender procedure; the reception capacity will be raised to 10 million passengers per year upon the completion. At the same time, MIA has upgraded the functions of the existing facilities and technologies, to introduce more humanization and smart technology, as to increase passengers’ convenience, to create more spacious and comfortable environment and a pleasant journey to each of the passengers. In the Executive meeting, Macau International Airport was confirmed to be rotated as the host for the meeting of next year. Chairman Deng stated in his speech: in the first three quarters of this year, MIA has increased its inbound passengers by 11%, China Mainland routes by 36%, Japan's route by 14%, and the Korean market has slightly dropped by 7%. Passenger traffic is expected to reach 8.2 million passengers throughout the year. To cope with the rapid development of Macau’s tourism industry and aviation industry, and the Opening of the world's longest bridge and tunnel combination - the Hong Kong-Zhuhai-Macao Bridge on 24th October this year, which will further promote the integration of the east and west coasts. MIA actively worked on the infrastructure development, to enhance reception capacity on limited land resources. MIA has joined in EAAA since 2003 and has rotated to host the meeting once in 2005. It is the second time MIA is rotated to host the EAAA meeting after 14 years, we look forward to the representatives of various airports coming to Macau to witness the unique development results of MIA. Every executive from different airports have discussion on the topic of Airport Expansion and Renovation, and have in-depth understandings on the challenges and difficulties during the process of planning and execution. 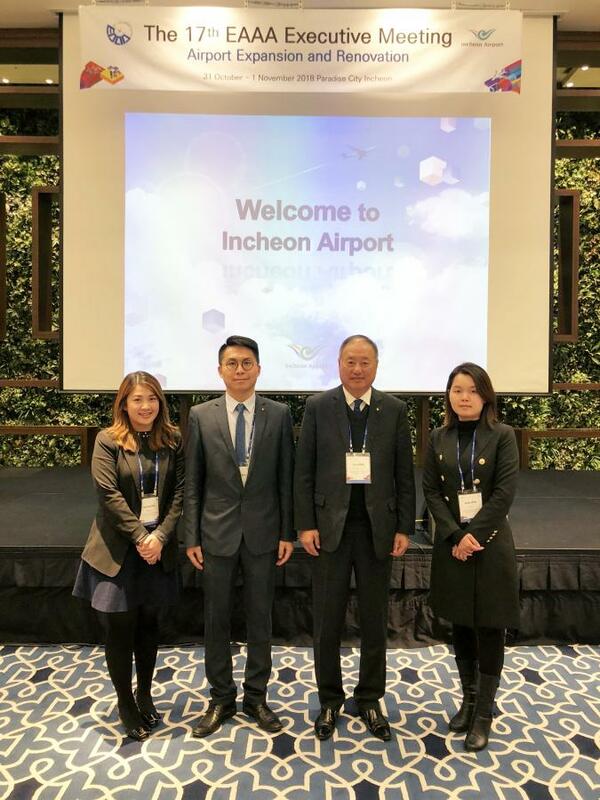 Executives are organized to have a visit to Terminal 2 of Incheon Airport, to introduce the smart technology and green elements that applied in the terminal. Other representatives from CAM included: Ms. Vicki Mou - Chief of Corporate Communication and Policy Research Office, and Ms. Adrina Ho - Manager of CPO. EAAA members include: China’s Beijing Capital Airports Holding Company, Shanghai Airport Authority, Guangdong Airport Authority, Airport Authority Hong Kong, Macau International Airport Co., Ltd. and Dalian International Airport; Japan's Central Japan International Airport Co., Ltd., Narita International Airport Corporation, Japan Airport Terminal Co., Ltd., Kansai Airports and Tokyo International Air Terminal Corporation; South Korea's Incheon International Airport Corporation and Korea Airport Corporation.